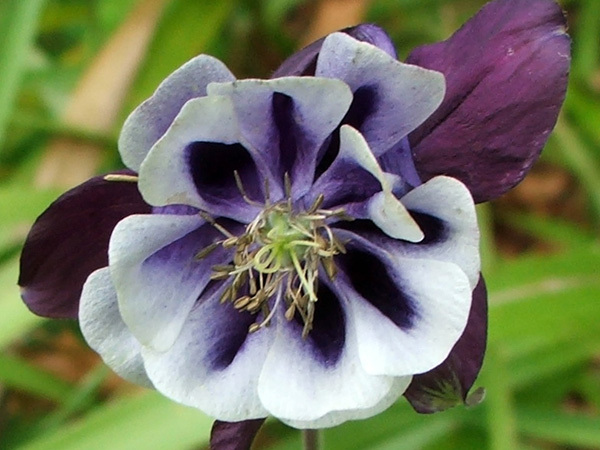 Aquilegias (Columbines) are enduring spring perennials, and a clear signal that the garden is on the move. As soon as the Aquilegias start flowering, I'd better be ready for action! Aquilegias are generous nuisances though - they provide far too many seedlings. They hybridise themselves with the help of the bees, so it's interesting to peruse the seed catalogues for new colour strains. The very first Aquilegias that I grew from seed were red and yellow in colour. I've still got some of these, busy flowering in the Driveway Border. And I have some plain bright yellows, which I always forget to take photographs of. Oops. Sorry about that! So the Aquilegias in my garden come in all colours and sizes. I notice in my mail order catalogues there are many interesting bi-coloured Aquilegias - and famous named varieties like Nora Barlow - to tempt me in winter. My latest purchased are lime green in colour, already planted out and waiting for next spring. Earlier in my gardening life I grew some large white Aquilegias from seed, and carefully collected their seeds after flowering. Of course the next year's seedlings were not the pure colour of the parent! If you are a think-ahead gardener you'll trim the foliage right down to the ground after flowering - it will regrow quickly, forming new fresh green ferny leaves. And the seedlings can be annoyingly numerous - you'll need to make appropriate gardening decisions and stick to them. 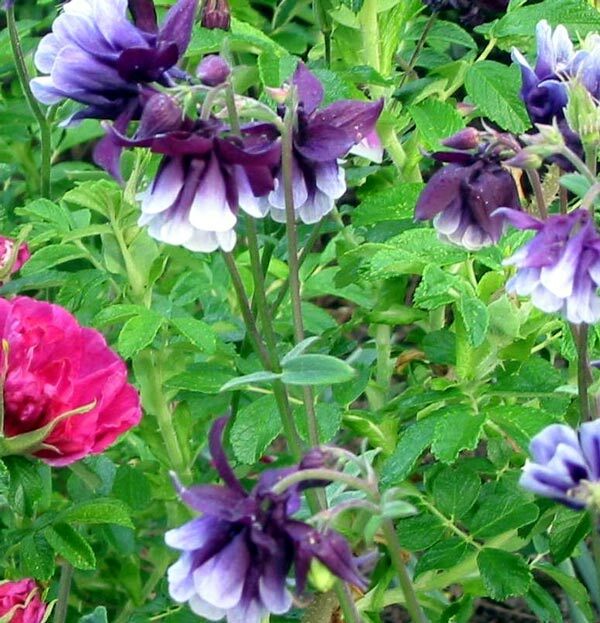 I've decided there will be Aquilegia-free areas in my flower gardens, and try hard to remove all offenders early. 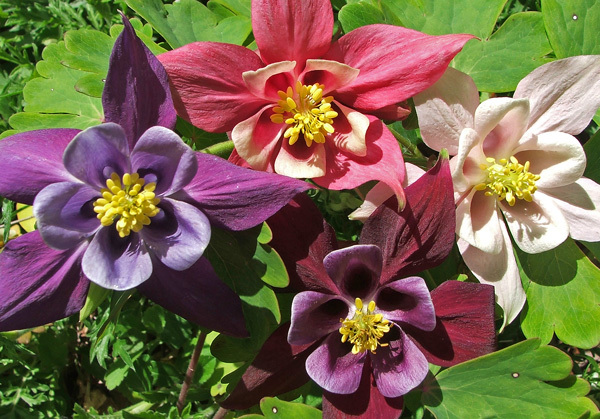 A note regarding Aquilegia photography - unless one cheats it's hard to get face-on pictures. Most of my Aquilegias shyly droop their flower-heads, so I've had to resort to picking and placing the flowers on top of some greenery.